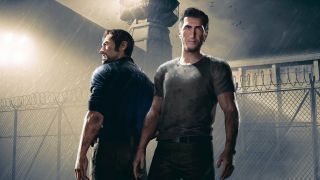 Josef Fares really wants you to know that A Way Out is not Uncharted. After revealing his latest indie project at E3 2017 earlier this year to a largely positive reaction, the director of Brothers: A Tale of Two Sons noticed the game was being reductively compared to Naughty Dog’s pulp adventure epic, mainly based off of the fact that one of its protagonists looked a little bit like Nathan Drake. Even outside of their budgetary differences, the parallels to Uncharted end almost as soon you begin to appreciate the audaciousness of A Way Out’s creative vision. A splitscreen co-op game centred around two prison inmates, the story can only be progressed when both players are present and controlling their character, either online or through local couch play. For an industry that typically treats co-op as nothing more than a tacked-on afterthought, an experience that revolves entirely around the splitscreen format is refreshing to say the least, and the positive response to A Way Out has been indicative of its appeal as a fresh and original IP. The game is being developed by Hazelight, a new team comprised of several developers who left Starbreeze Studios after finishing work on Brothers. Fares was the director of that critically acclaimed indie from 2013, and is now leading the production on A Way Out, which is being published by EA for release sometime next year. I caught up with him to discuss how development has been coming along since the game’s E3 reveal, and where the idea to create a pure co-op experience came from. "When you make a splitscreen game, it's like drawing two different pictures at the same time." And A Way Out is definitely risky. With the exception of a few standouts, the co-op genre has gradually been withering away as mass multiplayer continues to dominate the market of social gaming, leaving players hard pressed to find a modern, story-centric game catered exclusively to the splitscreen co-op format. Fares is aware of the uphill battle that A Way Out faces, then, but that’s precisely what drives himself and the rest of the Hazelight team to make something so unique. Many of those challenges, Fares tells me, arise from Hazelight’s commitment to maintaining the splitscreen display throughout the entirety of A Way Out’s story campaign (aside from a few major cutscenes), even if you’re playing online. Historically, splitting the screen has typically just been a means to an end, allowing both players to see their respective characters on one television at the same time in couch play, but Hazelight is quite literally pushing the boundaries of the format to explore it as a creative tool. Fares himself began his career as a professional filmmaker, before moving onto games with Brothers: A Tale of Two Sons, but he’s always been fascinated by the industry he now works in, and has plenty to say about the current state of the medium. You could easily say that Brothers is exactly the sort of experience that Fares is talking about: a quiet gem which only began to garner attention after people naturally discovered it on their own, duly falling in love in the process. Even four years later, Brothers still stands out as a breathtakingly novel concept executed with passion and care, but Fares tells me that the reception to his first indie hit wasn’t always rosy. Luckily, the game would go on to find much critical and commercial success, and that achievement has allowed Fares the opportunity to take another creative gambit with A Way Out. As two games focused on a pair of male characters who learn to become dependent upon each other throughout a shared odyssey, you can already detect a confluence of themes and ideas between Brothers and A Way Out. Are notions of brotherhood and companionship the kind of subject matter that Fares’ consciously chooses to explore in his work? You might think so, seeing as his own brother actually plays one of the main characters in A Way Out, but the director isn’t so sure. E3 was about getting people excited for A Way Out, but Hazelight plan to shed more light on the game soon to explain more about how it works, and why players shouldn’t be put off by its unique approach to storytelling. A Way Out will release in early 2018 for PC, PS4, and Xbox One.